I was looking at aerial imagery of various airports and noticed how some have a large number of runways (4-6), while others have a small number. Specifically, I noticed that Heathrow LHR only has 2 runways, but it is the busiest airport in Europe by passengers. In comparison, the following busiest airport have many more runways (CDG has 4, AMS has 6), but fewer passengers. As you can see, the top 3 all have 5 or more runways. There are 7 large airports with 5 or more rwys and they all fall in the top 16. The top 16 is rounded out by 5 airports with 4 runways, one with 3 runways and... LHR. The next 2-rwy airport on the list is Benito Juarez Intl. in Mexico City clear down at 21st on the list. Any busy airport with 2 runways has to make those runways work as tightly as possible with little room for error. Otherwise they end up with delays. If I sort the list by movements per rwy, all of those with 2 rwys rise to the top. 10 of the top 15 have 2 rwys. So, how does LHR pull it off? How do they manage to pack all those flights in to just two runways?There's a downside to handling that kind of volume with so few runways. The following collage gives a clue as to what that is. Those are just a random pick of arrivals at a couple of random times yesterday morning at LHR. There was no significant weather at the times. As you can see, you just don't arrive at LHR without being put in a holding stack. Every single flight I could find had to do at least one racetrack. At any point during the day, in places like Chesham, Effingham and Brentwood, if you look up there will be as many as 6 or 7 aircraft doing racetracks waiting to be cleared into Heathrow. 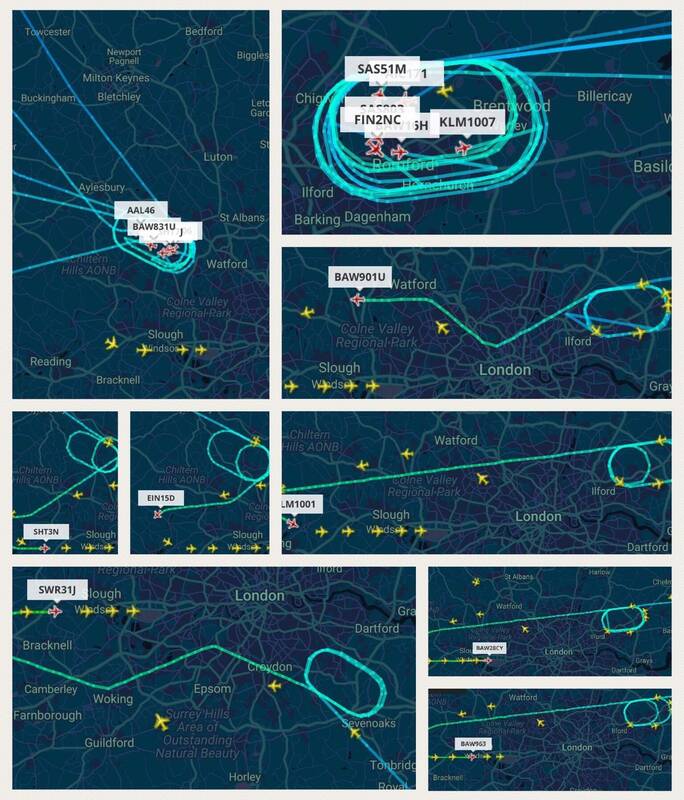 That makes for very efficient runway usage when there are 20 planes waiting in line, but it's terribly inefficient for the airlines and passengers to have to spend so much time burning fuel circling around London. On the flip side, building more runways has a down side too. It will get the planes out of the air quicker, but, as happens at Schipol - which has 6 runways - you can end up with a long taxi back to the terminal. All data was taken from Wikipedia. Don't assume that a higher number of individual runways means a higher possible throughput. The runways at LHR can be used at the same time - this instantly puts them at an advantage. Many older airfields have a typical A shape runway, with 3 intersecting runways - only one runway can ever be used at once in this configuration. Other factors would include noise abatement and licensing restrictions - airports are often controversial, with flights artificially limited by legislation. Beyond that, it's possible that not all runways are capable of operating with heavy (physically) traffic, may not have the same ILS capabilities and so on. Finally, just because an airport COULD host more aircraft than LHR doesn't mean it will. LHR is an exceptionally busy hub airport operating at almost maximum capacity all year round. I could build a 20 runway airport in Iceland and wouldn't come close to Heathrows throughput. When traffic count increases and money permits and real estate allows, additional runways are constructed (often aligned the same). For example, KPHX (Phoenix, AZ, USA), started with runways 8L and 8R. Years later, as traffic increased, a third runway was constructed. Now there are Runways 8/26 (single runway) and 25/7 R/L. All are aligned the same (about 076 degrees magnetic). Also, KDFW (Dallas/Fort Worth, TX, USA). They have 7/14 runways. Lots of large/higher performance aircraft using the 2 sets of parallel runways 17/35 L/R and 18/36 L/R, all aligned the same magnetic direction; 2 converging/diverging runways 13/31 typically used by lower performing aircraft. The parallel runways allow, under specific criteria, certain types of simultaneous operations resulting in accommodation of high traffic demand. The converging/diverging smaller runways allow simultaneous operation of lower performance aircraft whose course diverges immediately from the larger higher performing aircraft upon takeoff (allowing essentially simultaneous operations with the parallel runways). Note, if the initial route of the departing aircraft would be better served (from an ATC/expedited flow perspective), some higher performance aircraft will use the converging/diverging runways. Historical wind conditions in the area, amount of traffic, real estate available and access to funding, all play a part in the construction of runways. Each runway is considered two runways, e.g., runway 8/26 are the same concrete. Not the answer you're looking for? Browse other questions tagged efficiency airport-design or ask your own question. What are some differences that make the new 737 MAX winglets more efficient than a conventional winglet? Why aren't larger airliners such as the A380 more efficient than smaller ones?